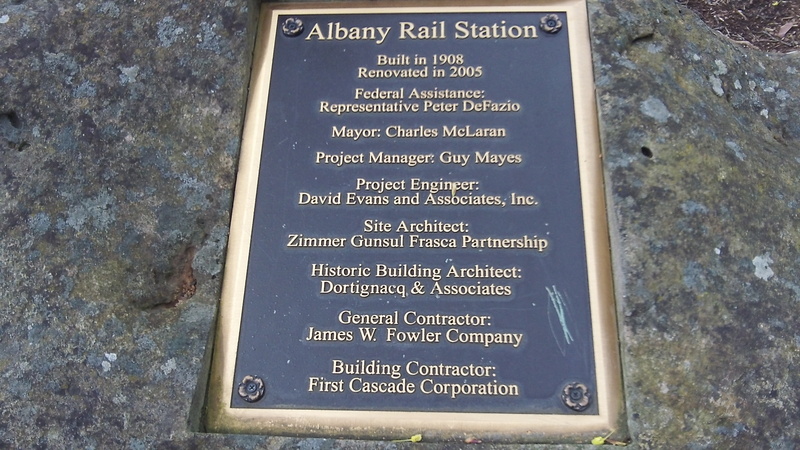 This marker at Albany Station reminds people of the big effort to rebuild the depot. The city council Wednesday unanimously endorsed a letter Mayor Sharon Konopa is sending to the chairmen and members of the Joint Ways and Means Committee, which writes the state’s budget. As of last report, the committee had declined to budget $10.4 million, as requested in the governor’s budget proposal, to continue subsidizing the Cascade passenger trains between Eugene and Portland with stops in Albany, Salem and Oregon City. According to ODOT, the committee had tentatively agreed to $5 million, an amount that might force the agency to prepare to shut the service down even before the first year of the 2015-17 biennium is up. Konopa said she understands that if the Cascade trains are dropped, Amtrak might close the Albany station, and she wonders whether Amtrak might then also cancel the Albany stop of the two daily interstate Coast Starlight trains, one in each direction. All of which amounts to a supreme irony since ODOT is spending about $10 million in state and federal funds on a long-term planning project to increase passenger rail service in the Willamette Valley. Gov. John Kitzhaber launched the process in 2012, and it’s projected to keep going till 2017 or so. And last year ODOT took delivery of two new Talgo trainsets it had bought with millions in federal stimulus money. The letter says that most days, the station parking lot is filled with the cars of train passengers, and it adds that when gas prices rise again, as they surely will, train travel will again be more attractive. The coming of recreational marijuana will bring literally millions in tax dollars. Perhaps some of that money could be used for public transportation and the potholes that make up Albany streets. 1. HOW did the mayor determine this? I don’t buy it and feel a LOT of the cars belong to people that work downtown etc. 2. IF the parking lot is already “full”, where are people going to park when ridership “increases”? Anyone can determine this by looking at the parking lot. No, people are not parking there and walking downtown to work. There is much closer parking to downtown businesses. While I may disagree with the mayor and city council in other financial matters being hotly debated, I fully side with her on this issue. America needs to remain committed to train travel. All transportation, public and private, is subsidized by taxes to some extent (airlines, highways for private vehicles, buses, and trains). Money for Amtrak is proportionally quite small. A search for the federal budget shows that it is about 2% of the entire budget. It’s difficult to find pie charts directly on the DOT or Congressional Budget Office sites, but if one believes the following link then of that 2% of the federal budget, in 2013 that was about 49 Billion dollars. Of which 4% (2 Billion went to Amtrak) while well over 50% 27 billion went to highways. I believe we should support trains with our taxes. There are definitely used, and they serve quite useful for folks who cannot drive (due to medical reasons or age) and who cannot fly (due to medical or other reasons). The cost to support Amtrak is minimal. If one wants to reduce government spending, there are much more efficient ways to do so. My apologies for my prior, mis-worded post. I was in a hurry in my and it shows. With respect to the budget, what I meant to say was . The Department of Transportation in total is 2% of the federal budget (not Amtrak). Of this 2% for the DOT, only 4% is allocated to Amtrak with the other 96% of the DOT budget going to other areas of transportation. So, doing the math .02 times .04 is .008 : Amtrak is 0.08% of the budget at the federal level : (not 8 percent but a tiny 0.08%). Thank you Peggy. I may have different reasons for supporting Amtrak compared to Stockman’s reasons for dismantling it. But I appreciate that he clearly states the reasons against it, mostly economic. I guess I am sensitive to the fact that a certain part of the population cannot drive themselves, nor fly for various health reasons. The bus could be an option for some, but the constraints of the bus also causes problems with some folks on long trips. But I’m repeating myself. I don’t view support of Amtrak as a ‘colossal’ waste of taxpayers money, but yes it does cost something.